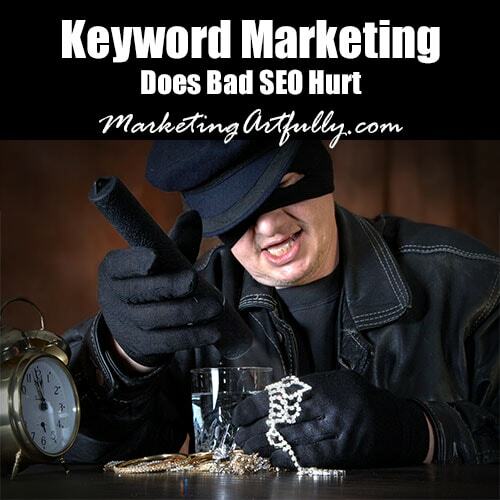 But I had an interesting question the other day, does BAD SEO hurt your marketing efforts. My thought was no, but after some research I am not as confident about that. It seems that bad SEO does hurt and has to be fixed when it is encountered by the Google. So what does that mean? If you doing keyword marketing 10 years ago (some of us were, really!) then doing HUGE HTML sites with lots of pages worked because there was not blog content to compete with. If you were doing Keyword or SEO marketing about 5 years ago, the prevailing thought was to make blog networks with “thin” content (meaning just a lot of SEO, few pages and little authority) and get them ranked and THEN pass link love back to your main site. This worked. If you were doing SEO marketing 2 years ago, the best way to make a big impact was to have a couple of crappy articles written, “spin” them and then post them to sites like Ezine Articles. This worked then. Oh, oh, oh, another thing to do was set up fake profiles on all the social media sites and directories with your exact keywords pointing back to them, or how about the fancy smanchy “fake” comments posted on websites all around the world with links back to your site? OOPS, forgot the make a Squidoo page, Wet Paint, etc and have links back to your site. If you are in the SEO marketing space now and staying current, you know these “tricks” no longer work, but do they actually hurt? After listening to an amazing webinar yesterday by Leslie Rhode of the SEO Braintrust, a absolute EXPERT in search engine marketing, I think they do! The cool thing was he took questions from attendees and “diagnosed” what had gone wrong. Almost everyone on the call had at some point done one or more of these “tricks” to get higher rankings in Google, but had since been “slapped” hard by Google, no longer appearing in search results. The thing that struck me is the amount of work that you have to do to UNTANGLE the harm that was done in the past. That fake directories thing, if you were using that technique, you might have 7,000 or 70,000 fake directory links that you have to contact and try to make legitimate or just ask them to delete them. ESL (English as a second language) blog comments, better try to walk back the cat and get those blog owners to delete your spammy comments. Leslie said that for most sites it was worth the effort to fix them in Google’s eyes, although I don’t know if I would have the patience to do that myself! Black Hat SEO Marketing is done in back rooms by programmers and is designed to “game the system” while perhaps hurting other sites. One example of this is hackers who hack WordPress blogs, redirecting them to sites for pharmaceuticals or loose women. When people do this kind of SEO, they are building sites that may be only up for a couple of days or weeks, get lots of illegal traffic and then get shut down by their providers and delisted from Google. They are not trying to build a business. Grey Hat SEO is when you are knowingly violating the terms of service of the Google (like spinning articles so there is no original content) but Google is not currently penalizing you for it. Another example of this kind of thing is to have white text on a white background thinking that Google can’t tell the difference. More about that later! White Hat SEO is boring. It takes time and energy. It means growing a website with great content, going and commenting on other peoples blogs, posting to social media and building an “internet city” that is built on a strong foundation, not on tricks and gizmos! We tell all of our people that it will take at least 6 months to see any improvement on their rankings and so LOTS of people don’t hire us, instead responding to one of those “we can get you on the first page of Google emails“. That having been said, we work mostly with legitimate business owners and are proud of the fact that nothing will “blow up” in their faces when we are done! Okay, I promised to talk more about Google and why even dipping a toe over the line into that gray area might hurt. Let’s take an example from today. Pinterest is a new social media network and it has great SEO and linking back properties. I stay on top of “stuff” and so I saw a software that we could buy which would automatically search the internet and “pin” things to Pinterest boards. Now, it was not good software, it pinned all the pictures to one board and they weren’t really pictures of what they should be (the title might be great dinners and the picture was of a dog). I have seen a bunch of spammers on Pinterest using this and a LOT of pictures getting flagged as going to inappropriate content. So why do they do it? Spammers and scammers and crooks are, and have been with us. They would rather try and cheat the system rather than doing the hard work of growing a business. I always wonder what would happen if they put all that effort into something productive….but that is their choice! Google uses mathematical formulas written by really smart guys and gals (called algorithms) to make sure that the very best content is being shown on their search results. Their client IS the searcher, not the advertisers or those of us creating the content. They do not care if we made a mistake and did something foolish, they will just take us out of search until we fix whatever it was that we did in the past that makes them mad today. So they have updates with cute names like Panda and Farmer and Penguin. These are tweeks in the search engine algorithm that penalize people using techniques that are gray or even black! I guantee that there are people getting TONS of traffic right now from those fake Pinterest pins but that Google will figure out how to stop them and all will be right with the world again. Long story REALLY long, if you are growing a legitimate business with a real online presence, PLEASE do a little research before you allow some fly by night SEO marketing company talk you into the “latest and greatest” SEO marketing trick that used to work but doesn’t anymore!